What is it to be a man? As a man, you have to stand on your own two feet. You have to walk with integrity. You must do your duty before God. Manhood is not a macho facade of “guy stuff” or an effeminate extension of caution. God our Father showed us what it means to be a man when He sent His son, a man’s man, for the world to see. A real man is, above all, Christlike. He protects the fatherless, is kind to the widow, generous to the needy, and lays down his life for his friends. He humbles himself, is a man of prayer, honors his parents, exhorts his brothers. He walks in faith and obedience. Jesus was above all focused on His mission (to glorify the Father). Never wavering, never distracted. 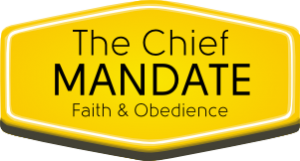 That’s what the chief mandate is about–focusing on the mission. Guarding against distractions, we must fight the sinful nature and the powers of darkness on all fronts, to bring glory to the Triune God, bring all things under the dominion of Christ our King, and enjoy His fulfillment and inheritance forever.